About 100 Kilometers east of Dusseldorf, nestled in the gorgeous tree-filled hills of Germany, bubbles a magical spring. We stumbled upon it in the most curious of ways. It started in America, when the day before our European trip, Kevin spilled a bottle of small white pills. He promptly cleaned them up, but missed one, which I later found on the counter. I hadn’t seen the pills since our first trip to Hawaii, when Kevin had given me one because I felt sick. I had felt miraculously better after taking that pill. As we rehashed that story, Kevin reminded me that the pills came from Tlacote, Mexico and had been made from holy water there. Curious, I looked it up Tlacote, and happened to find some webpages mentioning it and several other healing water sites. 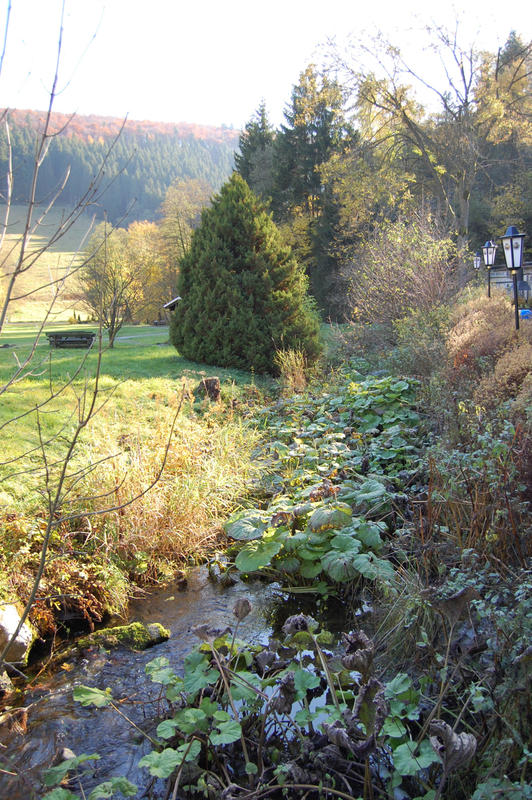 One of the sites was Nordenau Springs, in Germany. 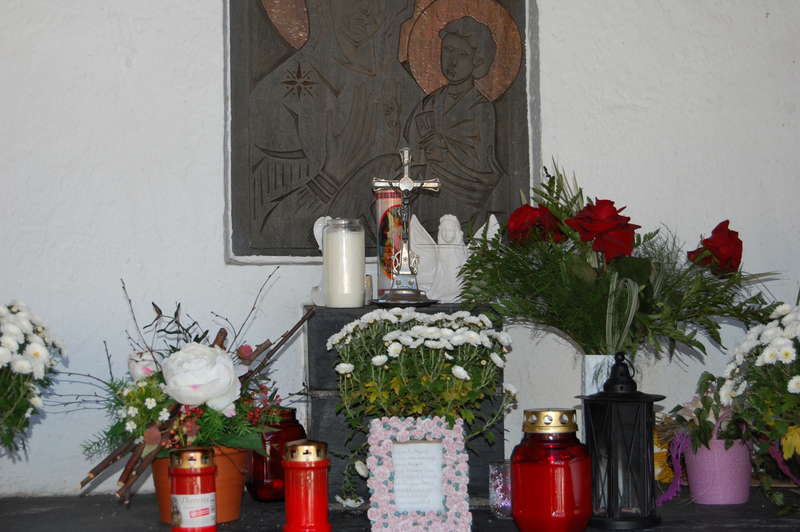 Nordenau Springs was discovered in 1992, the exact stories I found of the discovery varied depending on the website. 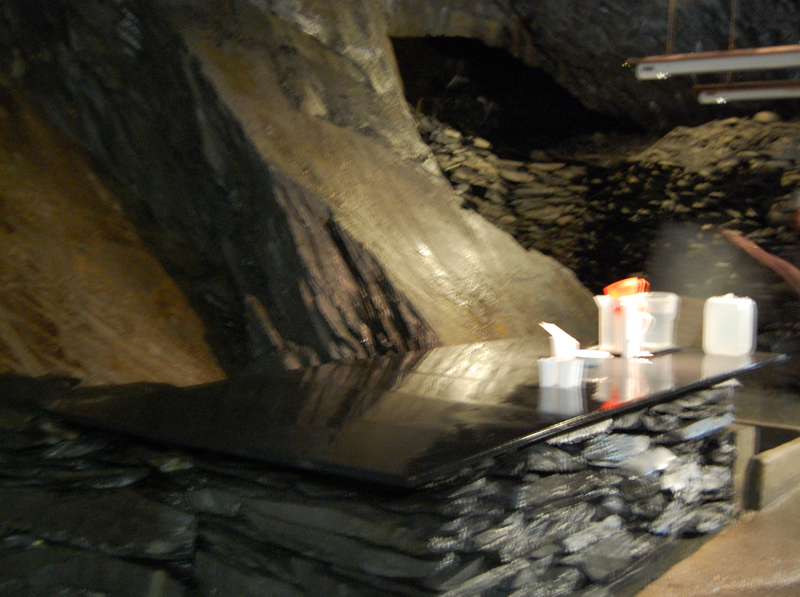 A guest at the Tommes Hotel fluent in the understanding of biodynamic energy decided to explore the slate mine near the cave and discovered it, or Mrs. Tommes herself met a flash of bright white light with crosses in it (the former is reported to be directly from the owner). Regardless, healings were reported, visitors flocked, miracles occurred in numbers that even got the attention of the scientific community and studies were done. 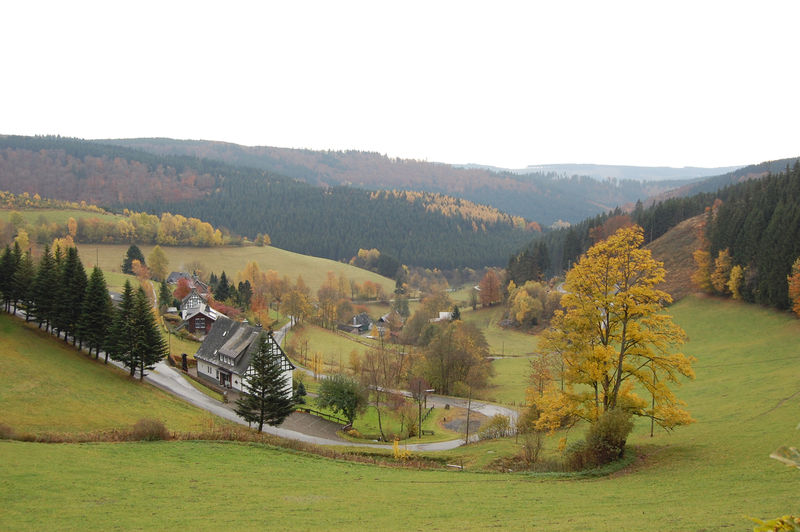 This Nordenau Springs was only two hours out of our way if we changed our route from Poitier to Berlin, and so with a few quick changes to our bookings, we were headed to Nordenau. We drove into the mountains late at night, so we missed most of the scenery, but we awoke in the morning to find our hotel tucked into the hillside, surrounded by a vast expanse of beautifully changing leaves. 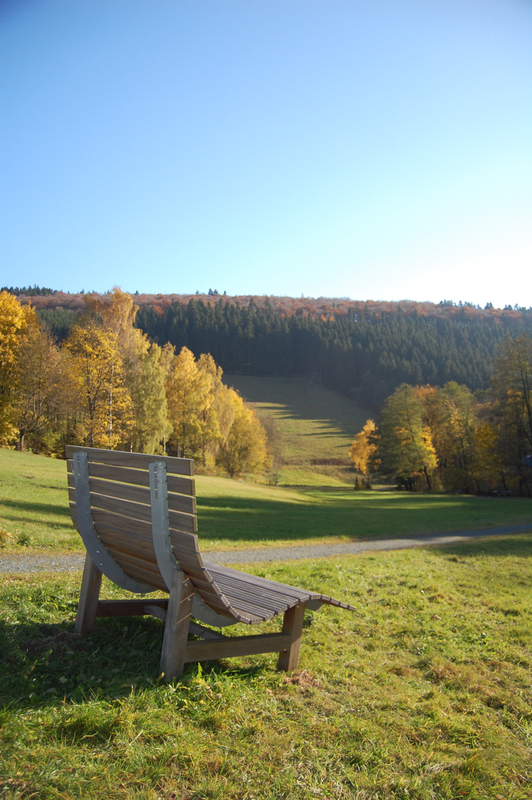 The red, yellow, and green fall trees were cleared in some areas to make way for small cows grazing or horses, and half timber houses littered the valley. 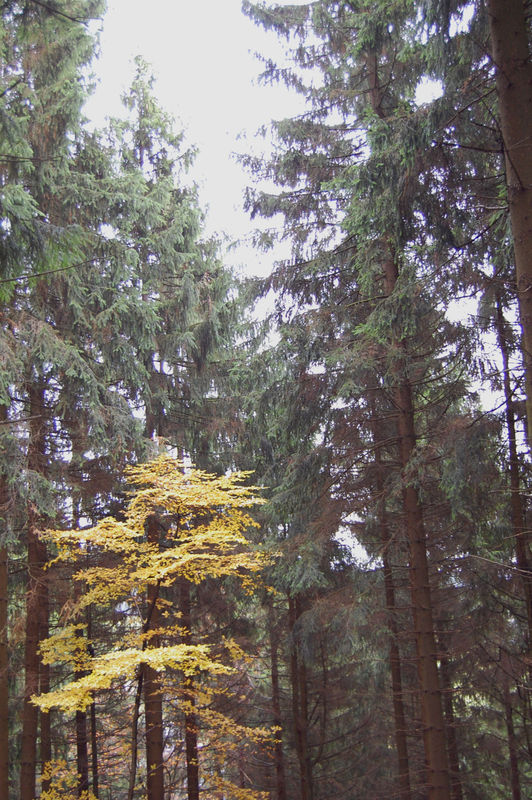 It was a scene from a German Fairytale. Even our hotel was a step back in time for me, reminding me so much of my German Oma’s house. 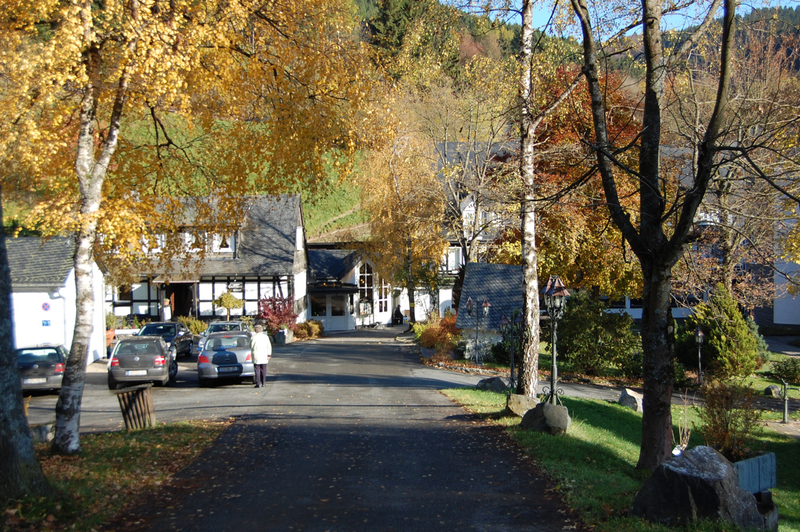 We did not stay at Tommes, it was full, but rather a nearby hotel hidden further in the woods. The proprieter of the hotel was very helpful, and I had great fun practicing my German. 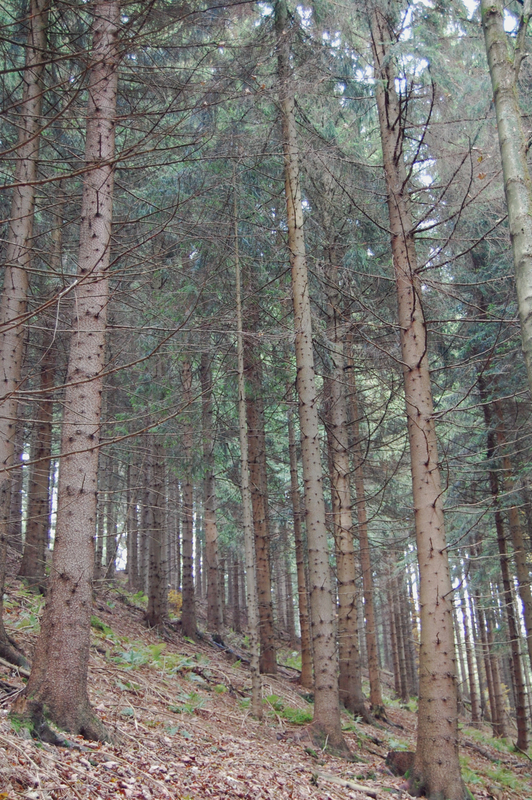 We had a nice German breakfast, and then took a small hike through the woods before driving down to the springs. At the Tommes hotel, we paid the 6.50 Euro entrance fee. The price is usually 7, a discount card had been given to us by our hotel. The price included a pre-packaged bottle of water, and we could bring in one empty liter bottle each to fill. 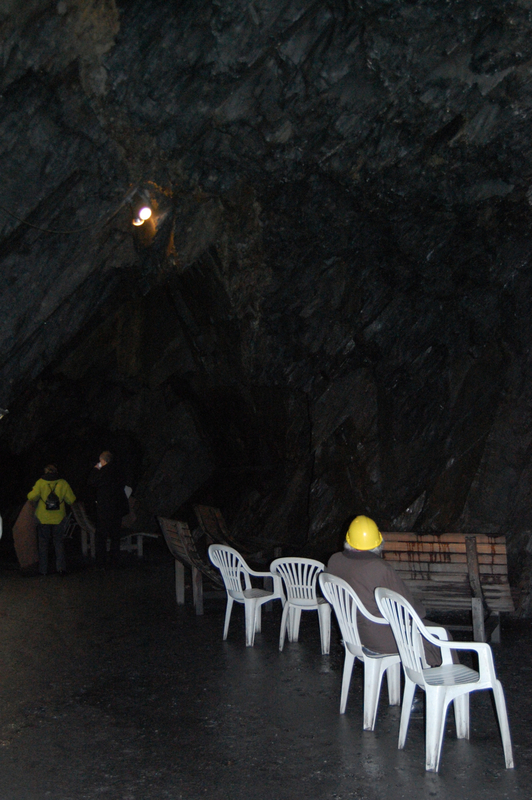 We waited in line on wooden benches for the one o’clock admittance to the slate caves. We were surrounded by mostly older couples, as far as I could tell, Germans. An elderly lady with a cane and her daughter sat next to us, speaking only German, but smiling kindly our way, and I was touched at her presence somehow. I wondered why she was there, and what was ailing her, and admired her determination to get there. As the man came to the door and let us in, and she had to slowly enter with her cane. We headed into a small damp room, and grabbed some soft mats to sit on. Being unaware of the procedures (sadly, with German ancestry, my German is minimal at best), we watched the people around us and followed their lead. Hard hats were offered, but we chose not to take one. As we walked down the small tunnel leading into the slate cave, water dripped peaceful all around us, flooding through cracks in the walls and leaking its way to the floor. 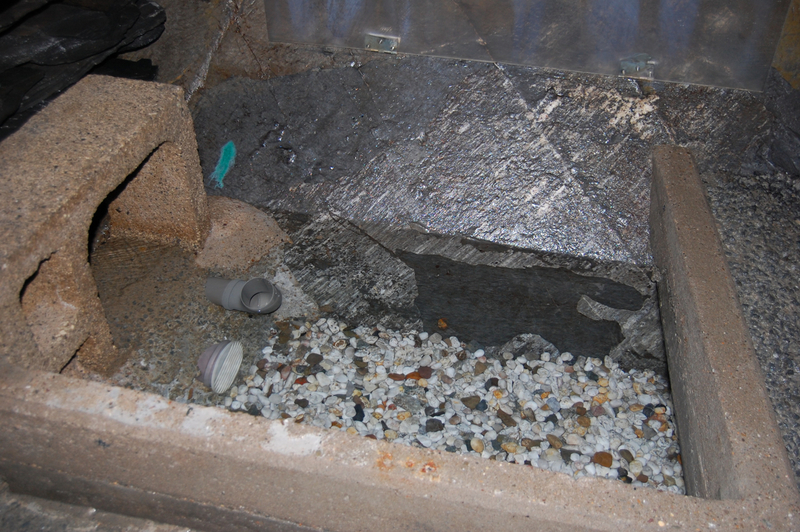 The tunnel opened out into a small room, where the spring sat covered by a small plastic lid. We placed our empty water bottles on the counter, where they were to be filled, and then sat on some comfortable reclining benches the hotel had provided. It seemed we were to sit here for a while, I had read something about the energy of the cave itself being healing, and so I sat back in my chair, and asked for healing of myself, and of everyone in the room who might need it. I thought a lot about worth. Do we feel we are worth the healing? Why should we receive it when others suffer? Does the universe want us to heal? And I thought of Kevin sitting next to me, how he wished me often to feel better, and thought, of course it does. We all wish for the health and happiness of our loved ones, and for others we don’t even know. It is this caring that shows us the universe does care, we are worthy of healing. By this time my body had relaxed quite significantly and a deep feeling of peace spread through me. The cave was quiet, the only sounds the drips of water that would occasionally surprise me with a splatter on my jeans or my face, and the bucket going into the spring as the man filled all our water bottles. I felt great love for everyone in the cave: for although I am no stranger to meditation, laying and sitting with rocks may be quite a new experience for some and it takes a open and willing heart to try it. I had read somewhere that someone wondered why the cave had been a slate mine all those years and no one had experienced a healing. Why now, when it was a healing hotel? And I imagined the miners, coming into the cave, thinking of their job, how they would best get the slate out, fights with their wives, worries about finances, all their daily concerns. I looked around at the people appreciating the cave today, laying still, closing their eyes, truly connecting with the energy of the place, and I think the healing energy was truly there all along. It was just waiting for us to recognize it, appreciate it. I have often thought that everyone who arrives at a healing place acknowledging its energy, thinking of healings, only adds to the power of that place. We help create it as healing for ourselves and others. We bring out what is inherently there. Nordendau truly felt magical to me. Maybe it was my German ancestry. Maybe it was memories of walking through an old salt mine with my Opa (German for grandfather) when I was young, and the happiness that brought me. But when the bell rang, and it was time to get up, drink our glass of water, and collect the water that had been bottled for us, I was sad to go. I would have liked to stay longer, many people stay for over a week, taking advantage of all the other therapeutic services the hotel has to offer too. Well, maybe next trip. For now I will have my memories and the warm happy feeling that followed me around all day. I can be pretty sensitive to these things, and indeed, for most of the afternoon, and car ride to Berlin, I felt a natural high, a kind of quiet, sweet, spacey sort of one. Thanks to everyone at Nordenau. Although their website is in German, someone was able to speak to us in English when we called and when we showed up.